Control box – with internal re-chargeable PP3 battery and 12 way plug. The control box can be unplugged after installation for testing or fault finding. The control box should be mounted where a thief cannot easily get to it. PIR head – a ceiling mounting type is supplied for factory fitting. A wall mounting type for fitting to built caravans. Mount the PIR where it can detect intruders. Avoid fitting where it may pick up air currents from heaters. Leg sensor - that should be fitted to the caravan floor adjacent to a rear steady. The magnet is fixed to the spindle so that rotation of the leg winder triggers the alarm. Ensure that the 12Volt leisure battery is disconnected, the mains hook up is disconnected and the 13 pin plug is not plugged into a tow vehicle (or test box). It’s well worth spending a few minutes deciding where to fit the alarm system’s components. Often wiring can be run at the back of bed boxes and cupboards, which saves drilling through the floor and working underneath the caravan. 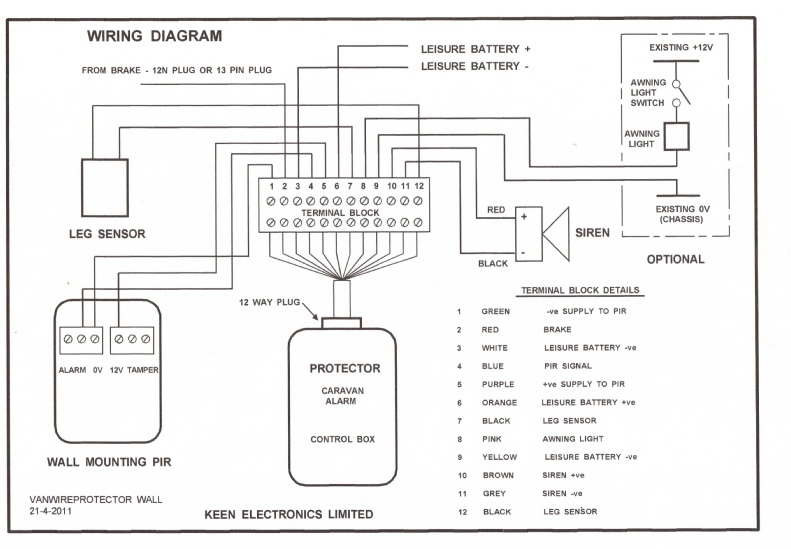 The wiring diagram shows how the system is connected. Once the location has been decided screw the unit to the caravan floor or panel. Screw the terminal block to the caravan floor or panel so that the 12 way flying lead can be connected neatly between it and the socket on the control box. Remove the mounting bracket fixing screws, and then screw the mounting bracket in the desired position. Re-fit the siren body into its mounting bracket and re-fit the fixing screws, ensure these are reasonably tight. Use the 2 way terminal block to connect the siren wires to the wires going to the control box. 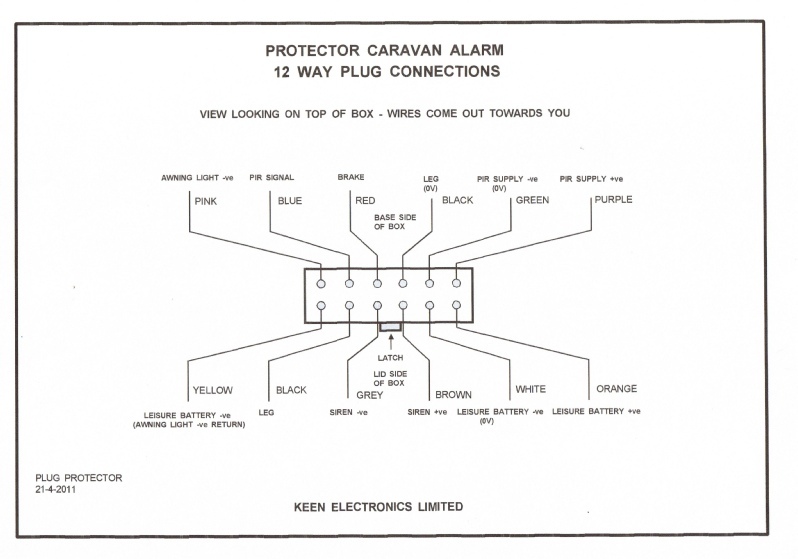 Fix the terminal block to the caravan with a single screw. This should be mounted in a suitable location in the ceiling where an intruder will be detected. Avoid mounting the PIR head where it will be subject to air currents from heaters. Remove the lens cover using a wide flat bladed screwdriver in the groove that separates the two halves. Carefully remove the printed circuit board, which is secured by one screw. The PIR head is mounted using the pre-drilled holes in the base. Re-fit the printed circuit board and tighten the single screw. Connect the three wires from the control box as shown on the appropriate wiring diagram. Refit the lens cover and press to snap into place. NOTE – the lens cover has a small keyway so will only fit in one position. This should be fitted to a rear steady, with the magnet fixed to the "in board" end of the spindle and the bracket assembly mounted adjacent to it. Rotation of the leg winder should cause the magnet to pass within a couple of milli metres of the sensor fitted to the bracket. Please refer to the diagram. Clean any grease off the spindle then stick the double-sided sticky pad onto the magnet, place the magnet onto the spindle then fix in place with the two cable ties. Tighten the cable ties with a pair of pliers - pull hard! Then cut off the surplus plastic from the cable ties. Mount the bracket onto the underside of the caravan floor, positioned so that the magnet passes within a couple of milli metres of the sensor fitted to the bracket. Finally, connect the two wires from the leg sensor to the control box as shown in the wiring diagram. Please refer to the wiring diagram at the end of the text. Connect the leg sensor to the control box using twin flat loudspeaker cable polarity is not important. Connect the siren to the control box using twin flat loudspeaker cable, observe correct polarity - red siren wire to siren + and black siren wire to siren -. Connect the PIR head to the control box using the 4-core cable supplied in the kit as shown in the wiring diagram. Please note that only 3 cores are used. Locate a convenient point in the 13 pin wiring to connect to the BRAKE wire - usually red in colour. The alarm installation is now complete and ready for testing; ensure that the key switch is in the anti-clockwise (OFF) position. Then re-connect the leisure battery to test the alarm. The button on the key fob marked LIGHT can be used to switch the awning light if required. The wiring diagram shows how this should be connected. 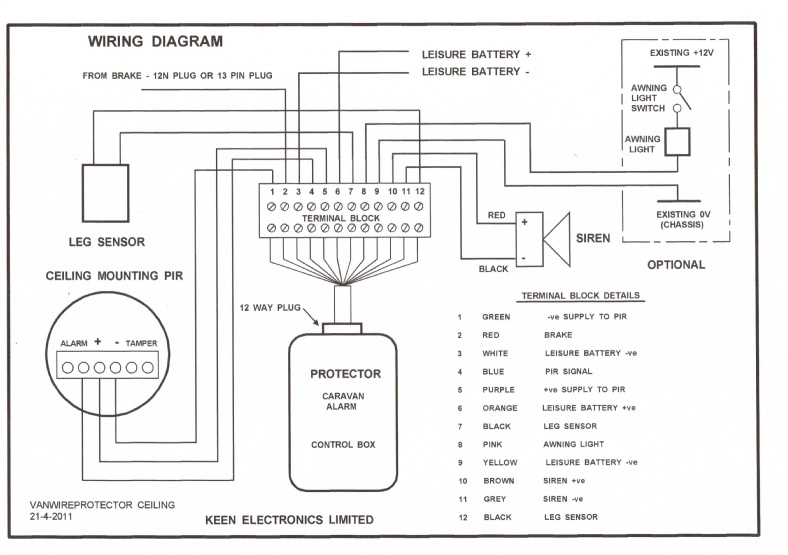 IMPORTANT NOTE – the control box MUST be connected exactly as shown in the wiring diagram. The switch inside the control box is a transistor NOT a relay contact. If you cannot locate the negative return wire to break into then contact Keen Electronics who can supply you with a relay. This enables the positive feed wire from the awning light switch to be broken into and switched by the control box via the relay. Now turn the key switch clockwise, the siren should “cheep” once. NOTE – when pressing the ALARM or LIGHT buttons on the key fobs you need to press the buttons for a couple of seconds. Press the ALARM button on the key fob to switch the alarm ON. The siren should cheep twice indicating the alarm is on. Press the ALARM button a second time, the siren should cheep once indicating the alarm is OFF. Now press the ALARM button, siren cheeps twice and alarm is ON. Now press both buttons together, siren sounds for 2 minutes, or until ALARM button is pressed again. When the alarm is ON and the alarm is triggered the siren should sound for 2 minutes, unless switched OFF with the ALARM button on the key fob. NOTE –once the alarm has been triggered the red LED on the control box will stop flashing regularly and will flash a certain number of times, pause, flash the same number of times, etc. The Alarm Status table in the DIAGNOSTICS section of the Operating Instructions gives number of flashes for each sensor. The LED will continue flashing until the alarm has been reset with the key switch. The LED will revert to normal regular flashing when the alarm is next turned ON. Turning the alarm OFF will then stop the LED flashing. This feature is useful to advise the owners if the alarm has been triggered in their absence and for fault finding (especially intermittent false alarms). When the alarm is ON the status LED on the control box will flash once a second. When the alarm is turned OFF the status LED will go out. If while the alarm is ON an alarm occurs, the siren will sound for 2 minutes and the status LED will flash a certain number of times, pause, flash the same number of times, pause, etc. The alarm can be turned OFF then back ON then OFF, but the LED will keep flashing. This enables the sensor which has triggered the alarm to be easily identified. To reset the status LED the small key is used to turn the control box off, then back on again. On turning the alarm back on with the key, the siren will “cheep” once and the LED will not flash.